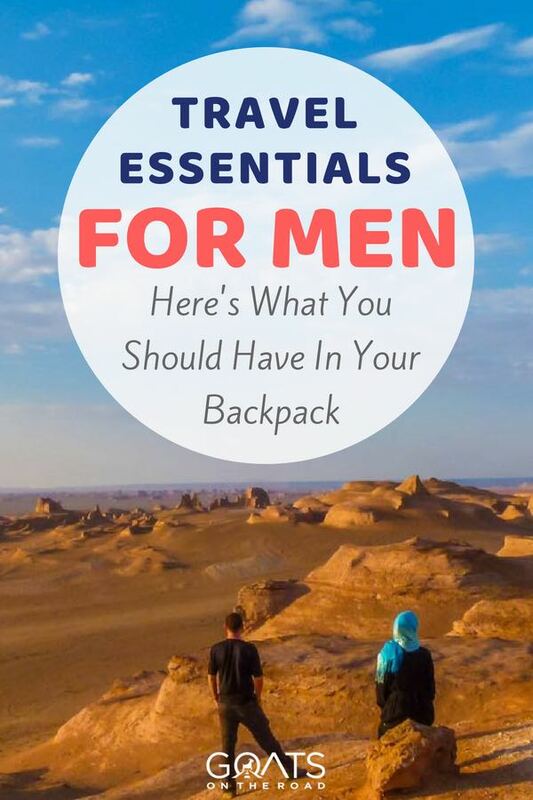 We’ve written about what the ultimate packing list for full-time travellers, we’ve given a breakdown of what’s in my backpack (and should be in every woman’s bag), so now it’s time to put together a list of travel essentials for men. 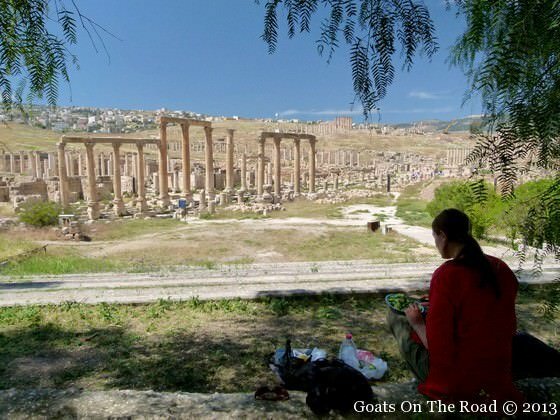 In this post I’ll share the travel packing list for the items in Nick’s backpack. 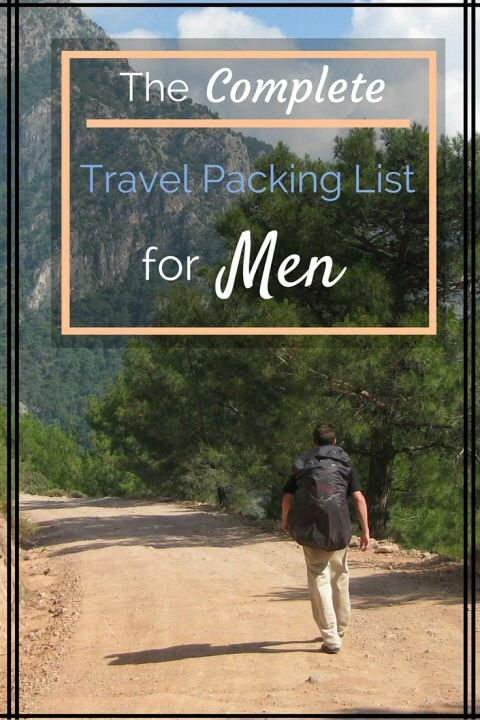 However, before you even attempt to start making a travel packing list, you’ll need to choose a backpack and then purchase the ultimate travel essential for men: packing cubes. These little things are amazing. They keep your clothing compressed (taking up less room in your bag) and they help to keep everything organized. Priceless. 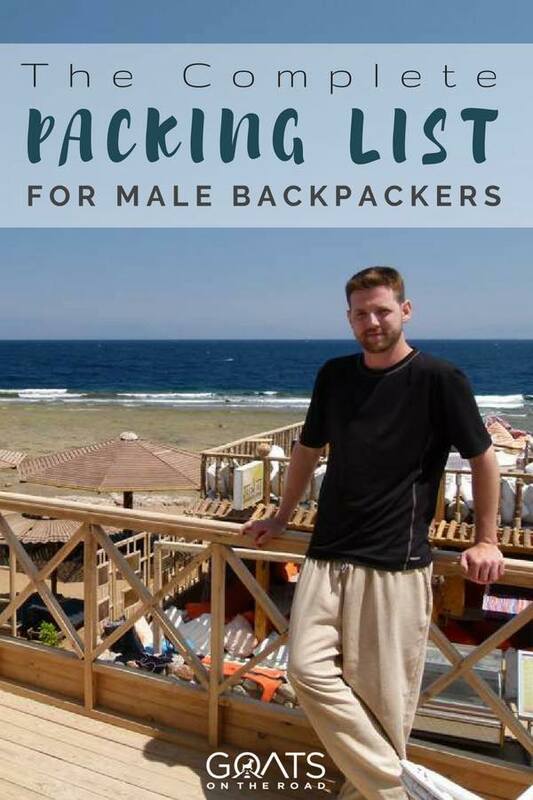 Here’s our list of the travel essentials for men, who are backpacking around the world in various climates. 1 x Thermal, base layer, long sleeve shirt. In cooler climates, it can be worn alone. Or, if you’re planning to go into temperatures below zero, you can wear the thermal top as a base layer, and add a fleece or jacket on top. 1 x Tight-fitting fleece. Look for a warm (but thin) fleece to wear on top of your base layer in cold climates. 1 x Lightweight, waterproof, windproof jacket (preferably with a hood). If you wear a t-shirt, thermal base layer and a fleece, then top it off with this jacket, you’ll be nice and warm. Nick wears a Northface jacket. 2 x Cotton t-shirts. Choose darker colours as they won’t stain as easily! 3 x Quick drying, anti-microbial t-shirts. Quick drying shirts is the way to go, especially in humid climates where clothes might not dry all that fast. These are definite travel essentials for men. 1 x Cotton, collared, button up shirt. If you’ll be in cooler climates, opt for a long-sleeved top, and if you’ll be in warmer places, go for a short sleeve shirt. These are ideal when travelling in conservative places, dressing up for a night out, or when you need to look a bit more respectable. Nick wears and recommends shirts by Prana. A typical travel outfit for Nick: fast drying t-shirt and loose, comfortable pants. 1 x Thermal base layer pants. Even if you don’t plan to be in a cold destination, you never know where you’ll end up. Base layer pants take up hardly any space, so you may as well pack them. 1 x Hiking pants. These are a must. Get comfortable ones that you can wear on travel days, or when you’re out trekking. Make sure the pants are lightweight, quick drying and have side pockets. Nick wears hiking pants by Columbia. 1 x Dress pants. Depending on the type you get, they can be comfortable for long travel days and can also be worn for a night out. Nick loves his BluffWorks pants and says they’re definitely travel essentials for men. These pants don’t wrinkle! 2 x Board shorts (bathing suit). Whether you’re heading to the beaches or not, you’ll want to pack a bathing suit. Be prepared for pools or waterfalls! 2 x Regular shorts. You probably don’t want to wear board shorts around a city. Pack a couple of pairs of nice shorts. 7 x Pairs of fast drying underwear. With only 7 pairs of underwear, you’re going to need to do laundry more regularly. You’ll want quick-drying and moisture wicking underwear. 1 x Pair of warm socks. For cold climates and trekking. 5 x Pairs of thin, quick drying socks. Again, quick drying is the best. 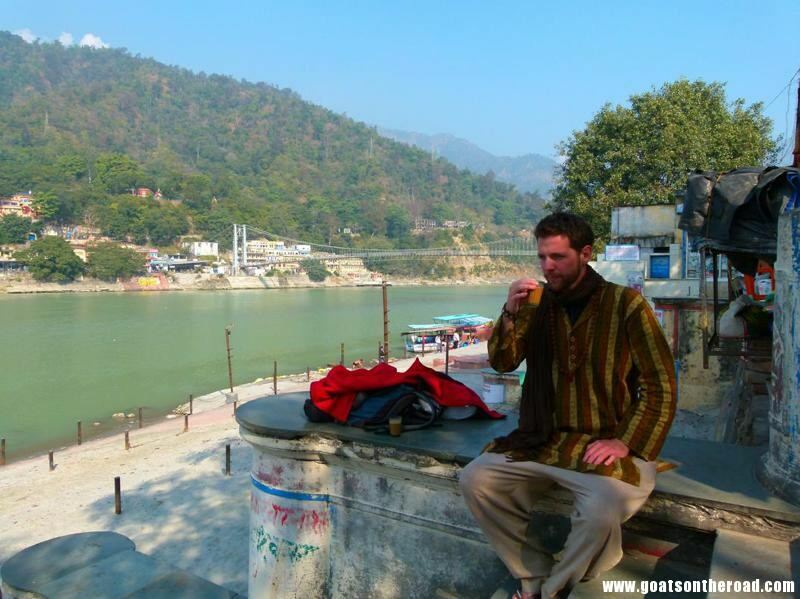 An Indian outfit, long loose shirt and pants. 1 x Pair of flip-flops / sandals. Depending on what you’re more comfortable in, bring a pair of basic flip-flops and if (when) they break you can just purchase a new pair abroad. If you prefer a sturdy sandal, pack yours. 1 x Pair of hiking/walking shoes. Nick currently wears Keens and recommends that brand. He’s worn Merrells in the past as well. Once these toiletries run out, just purchase some more while you’re on the road. 1 x Baseball cap. If you’re a hat person, pack a hat for those sunny days. 1 x Toque (for non-Canadians, this is a winter hat or beanie). 1 x Pair of sunglasses. You can purchase cheap sunglasses around the world if you need to. 1 x Fast-drying, anti-microbial towel. This is a must. These towels are great for the beach, waterfalls, or after a shower if needed. 1 x Pillow case. You can stuff it with clothing and make your own pillow for travel journeys. Or, use it in a hotel if you want. 1 x Headlamp. Necessary for camping, hiking, late night walks, etc. 1 x Heating coil. This isn’t necessarily one of the biggest travel essentials for men, but it’s an item that we use. It’s a small coil that plugs into the wall. You place the coil bit into a metal cup of water and within minutes the liquid is at a rolling boil. We’ve boiled eggs in a cup, boiled hot water for instant noodles, oatmeal and tea / coffee. 1 x Stainless steel, lightweight travel cup. I recommend having this as it’s great for mixing instant oatmeal, having instant coffee, tea or cocktails! Bring them to the beach, hiking, to the park, etc. 1 x Stainless steel travel plate. These are ideal for eating messy foods on a bus, train or having a picnic. 1 x Multi-use knife. Useful for many things. 1 x Money belt. It looks like a regular belt, but there is a zipper in the back of it (the part that is up against your body), which opens up to a place to store your cash. 1 x Universal sink plug. If you plan to do laundry in the sink, you’ll need one of these. Surprisingly, they are difficult to find abroad. When packing, the name of the game is lightweight and fast-drying. If you plan to travel around Europe, you may want a pair of jeans, but if you’ll be in Southeast Asia before that, maybe consider purchasing the jeans once you’re actually in Europe, rather than carrying them around with you. When you’re carrying your life on your back, every pound adds up. You’ll end up buying new clothes along the way, leaving old ones behind and ditching the worn-out ones. So don’t bring any of your favourite clothes on a world trip – unless you won’t mind if they need to be left behind / thrown out. Everyone’s packing list is different. 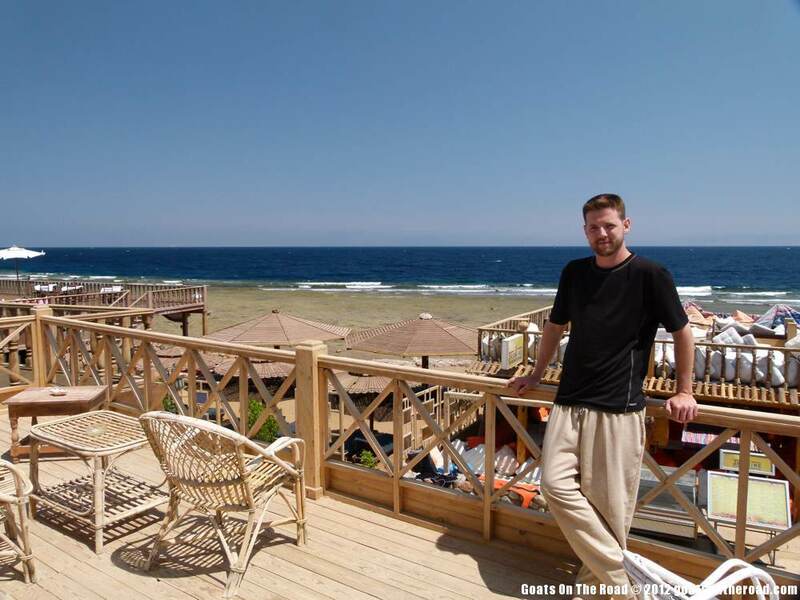 Everyone has their personal “must-haves” but this list has worked for Nick for his 8 years of travelling the world. 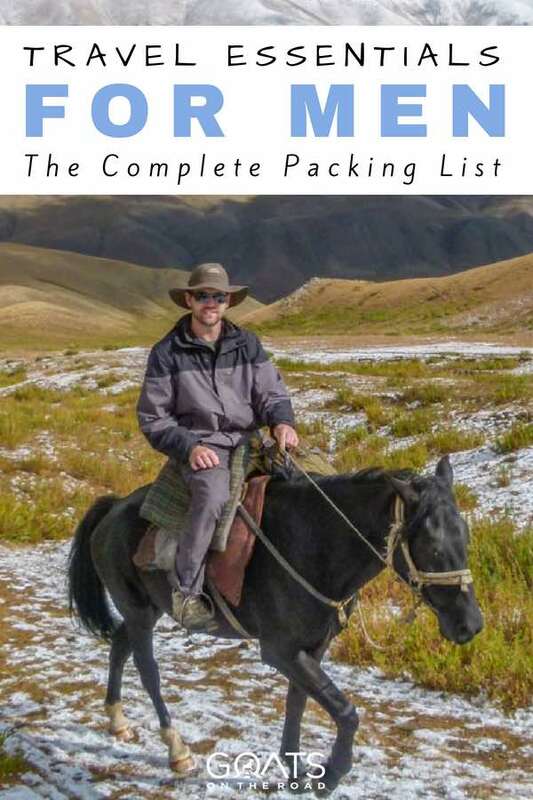 Some things have been added, while others have been removed, but for the most part this is a great list of travel essentials for men. Your post here explains a lot. Man thats not even near of “light weight” i carry 20L back that weights less than 4kg and is handluggage size what makes traveling via planes lot easier. Now that’s lightweight travel! We’ve actually downsized and joined the world of ultralight travel…not 4kgs, but more like 10kgs. hi nick.. thanks for sharing. This is a cool list! Me and my boyfriend are going on a long trip in Asia and we need to pack our luggage good. It is for first time for us to go backpacking in another country, so we definitely need some advice for what we exactly need to pack and prepare. I believe that I really need to consider taking only the most necessary things. Thanks for the post! I will share it with him! I am planning a solo trip and this is very helpful. Thanks for sharing! -Sunglasses should NEVER be ‘cheap’ ones. They’re your eyes! Cheap plastic lenses block visible light but do not block UV rays. As visible light diminishes, your pupils dilate letting more of the invisible UV rays! If you are going to NOT scrimp on something, its your sunglasses! -I suggest a large sealable plastic bag (ziploc style) to do your laundry in. Much better than a sink. Put your clothes in there, water, soap, close and agitate without any mess or spillage. Empty fill with clean water and rinse..I do it twice.